October is a busy month for festivals, and one that you won’t want to miss is Party of The Pines, a country festival taking place on October 20-21. It is the first country music festival taking place at Bienville Plantation located at White Springs, FL. (known for its premier hunting and fishing resorts). You will enjoy a two day festival full of non stop country music, including two stages, camping and RV accommodations and a variety of food and beverage options. This country festival highlights a great line up of artists such as Keith Urban, Miranda Lambert, Jake Owen, Brothers Osbourne, Maren Morris, Easton Corbin, Ryan Hurd and more. VIP Patrons receive special parking, entry privileges and reserved seating. Their unique VIP area offers a never before experienced ambiance, decor and awesome activities. VIP Guests enjoy exclusive amenities from gourmet meals to prime concert viewing. The Jacksonville Landing hosts and presents an amazing bar selection! VIP Tickets include 3 complimentary beverages each day. Your bar is staffed with experienced bartenders who will gladly make any drink you would like to purchase. The NFL and Jaguars confirmed yesterday that the team’s home opener vs. the Tennessee Titans will be played Sunday at 1 p.m. at EverBank Field, as scheduled. The Jaguars followed that announcement with word that the team and owner Shad Khan will make a $1 million donation to Florida’s First Coast Relief Fund, with Khan personally appealing to the Jacksonville community ahead of Sunday’s game to join the recovery effort assisting those affected locally by Hurricane Irma. “Jacksonville gets labeled as ‘small market,’ but it has a heart bigger than any community I’ve been associated with in my life,” Khan said. “Jacksonville will recover and come back stronger than ever, but who couldn’t use a little help from our friends? The Hurricanes' road game at Arkansas State has been canceled with no plans to make up the contest as the teams do not share an off week later in the season. The University of Miami has canceled classes for the rest of the week and Mark Richt has released his players to seek safety from the storm. The home opener for Florida International against Alcorn State has been postponed indefinitely. School officials are looking into alternate options, but announced the game will not be held on Saturday as scheduled. The Florida State Seminoles have moved the kickoff time for the Seminoles' home opener against Louisiana- Monroe from 7 p.m. ET to 12:15 p.m. ET on Saturday. The Central Florida Knights will still play Memphis this weekend, but the game has been moved from Saturday to Friday night at 6:30 p.m. ET. Bellwether Restaurant opened on April 13 and is located at 100 N. Laura Street in downtown with a an outside patio area and has been serving lunch followed by happy hour. Now, the restaurant is preparing to serve dinner until 9:30 p.m. on Wednesdays, Thursdays and Fridays, with special hours for downtown evening events. Once dinner is implemented, the majority of the lunch menu will still be available with some sandwich items being replaced with entrees and shareable appetizers. Some of the items will include a kimchi plate, duck breast, salmon and vegan entrees along with pie and cake desserts. The prices will range from $17 to $25. Their staff has been tweaking recipes and business flow over the past few months and a lot of emphasis has been placed on to go orders. They have set up the hostess stand with a tablet and card reader to take the to go orders. They are also saying that in the next few weeks, they will start doing lunch delivery and a weekend brunch. On Saturday night, No. 1 Alabama will take the field against No. 3 Florida State for the Chick-fil-A Kickoff Game at the new Mercedes-Benz Stadium in Atlanta. Jalen Hurts returns at quarterback and both Damien Harris and Bo Scarbrough return in the backfield of what should once again be an elite offense to compliment the best defense in the nation. The Crimson Tide ranked seventh in the nation in total yards with 6,829 and averaged 38.8 points per game as well, good for 16th best in the country. Florida State had a breakout star in redshirt freshman quarterback Deondre Francois last season. Francois showed poise beyond his age with 3,350 passing yards and 20 touchdown passes in 2016 despite playing in a run-heavy offense. The young quarterback should see an uptick in pass attempts this season, but the Seminoles still figure to be an elite rushing team with a strong backfield and offensive line. The Jacksonville Agricultural Fair began on Wednesday and started off with Craig Morgan performing on Thursday, and on Friday the Fall Free Gator Country concert series. Craig Morgan has performed recently at the Jacksonville Landing in July and has always put on a great show. 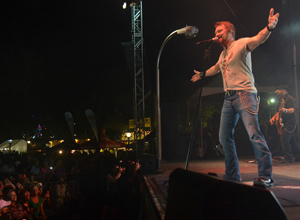 A source says that Craig Morgan performed amazing on Thursday Night and brought in a big crowd for the fair’s concert series kick off. 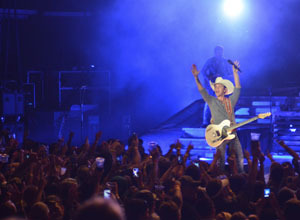 He is known for his favorite songs, “International Harvester”, “I Got You”, and his newest song “Waking Up Lovin You”. 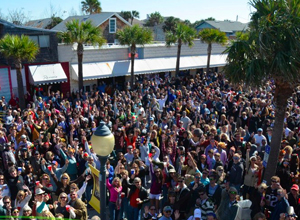 Neptune Beach Fla - What started as one lonesome bartender has evolved into a beaches tradition that many depend on as part of their holiday routine. Thirty years ago, one bartender was working on Thanksgiving Day and called his friends to keep him company. The friends showed up, along with the bartenders’ relatives and the rest is history. 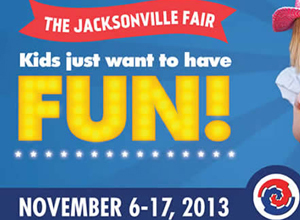 The 2013 Greater Jacksonville Fair will be held Wednesday, November 6th through Sunday, November 17th. Fair information may change or be up-dated as needed. The Youth Horse Show will be held on Saturday, October 19th, at the Jacksonville Equestrian Center. Click here for Horse Show information. For updates on events taking place at the Fairgrounds before or after the Fair, check Expot Center Coming Events page. 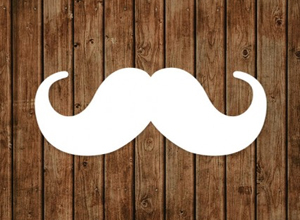 The Following Exhibits, Contests & Sales are Located in Exhibit Hall "A"
Gentlemen—what style will you be going for this Movember?